(From Sigma lens literature) This super-wide-angle lens exhibits minimal light-fall-off with superior peripheral brightness. The iris diaphragm has 9 blades to obtain beautiful out of focus images in the foreground and background. This is an ideal DG lens optimized Digital SLR camera. The minimum focusing distance of this lens is 20cm (7.9 inch) and it has maximum magnification of 1:4 with fast f/1.8 maximum aperture. 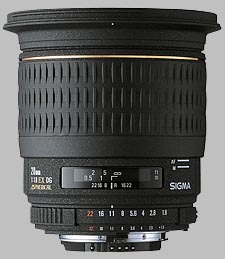 I’ve grown very attached to the Sigma 20mm f/1.8. I held off a long time buying one because of the widely mixed reviews. However, the appeal of a 20mm prime that opens up to f/1.8 eventually wore down my resistance. Now that I own it, I am hooked. I’m not a pixel peeper, but I do know when I like a lens or don’t like a lens. At various points I’ve had the Canon 24mm f/2.8 and the Canon 28mm f/2.8. From the first few photos I shot with each of them, I just knew I was going to be returning them--and, in fact, I did. They both went back. I’d heard great things about each lens, but I just felt that the performance from each of them simply didn’t make up for the fact that they only opend up to f/2.8. I compared the photos from these lenses to photos made with my f/2.8 zooms, and the zooms won each time. With this baby, though, I get a nice, wide lens with a big aperture…and I like the photos I get from it. I find that my "keeper" ratio is higher with this lens than most others I own, save the 135 f/2L and the 85 f/1.8. Perhaps I got lucky and got a “good” version of the lens right off the bat. All I know is that it is another prime lens that is spending a whole bunch of time in my bag. Focus just front of the lens. Only f1,8 20 mm in the world! Listprice is 700$. You shouldnt pay more than half of that. For the my price it is a funny little lens. Use on starry nights or when you want to do landscape with something up close. Compared to Canon 10-22 it is soft until 8,0 but the Canon lacks 1,8 - 2,8. Recommendet if you find it for the right price and is not decentered. This lens is often om my 400D, it gives nice pictures with very little distortion and good contrast when used in the range f2.8 until f14. AF sounds weird but functions well. Ain't nothin else like it. Literally it's own class. Nothing that's simultaneously as wide and as fast. A touch soft wide open, but this is mostly noticable in daylight. It's a bit dreamy wide open in bright light. However, in dim light, when you need it, the fine detail is certainly there. Even out to the corners. Remember, even at 20mm, 1.8 is VERY shallow. My Nikons have always done well with this lens, but YMMV when it comes to focus accuracy. I believe I have some correction dialed in on my bodies. Canons seem to struggle with this lens. There are some complaints below about having trouble focusing in low light--this is true of MOST cameras and lenses this wide or wider! Try it with lenses in the 14-16mm range and you'll see the same. It's a technical limitation, not a lens quality issue. Also, a story about build quality and warranty repairs: the lens feels rather robustly built, but as I was transitioning from film I was using this on a D2x. The D2x and this lens destroyed each other. The aperture bladed crumpled and the aperture arm on the camera stripped. Nikon fixed the body under warranty (only a couple months old!). The lens however was just shy of four years old, and just about to go out of warranty. It took Sigma at least EIGHT attempts to properly repair my lens so that a) the aperture blades didn't implode and b) it was as sharp as it had previously been. In seeing how this lens performed when improperly re-assembled, I can imagine that some must come from the factory that way and be very soft. I'll give Sigma credit: they kept trying until it was fixed to my satisfaction. But you can see from this story that there is the potential quite a bit of variation in quality in the end product. Something I don't see often in reviews of this lens is it's close focusing capabilities. It can focus VERY close--within an inch of the front element! Combined with it's wide angle of view this can make for some interesting effects. Also the bokeh is pretty neutral all around. Wide + close + point lights = interesting effect, for both still and video. So, provided that you get a well assembled sample, this is a STUNNING lens, which has no other market equivalent because of many things it offers: speed, angle of view, close focus abilities. Totally usable wide open and VERY sharp closed down. A little soft wide open, but certainly usable. I sold it because the focusing was just terrible in low light. If you want WIDE and FAST, well, there simpy is no other way to go. IQ is not bad, considering price and the technological breakthroughs (and compromises) for this lens. AF is not HSM, so it's slow. It also tends to front-focus (at least the copy I had). Great price for 20mm wide and f1.8 speed, FF compatible, Very sharp from f2.5 (good wide open), Very good contrast, 8" minimum focusing distance a boon, Grippy and wide MF ring with solid stops at each limit, Feels like a tank. Sigma has a good lens here to which Canon really has no answer for. My biggest gripe is the overall "handling" of this 20mm beast with its somewhat large build and clunky "DF" focus mechanism. But all in all, the pros far outweigh the cons and the image quality it produces is very good. I've got a good copy and plan to keep it for a long while.